Mr Brainwash's real name is Thierry Guetta, he was born in Garges-lès-Gonesse in 1966, he lives in Los Angeles, London and Paris. He started his career filming the big names of street art, including Banksy who was a great inspiration to him. His style is a mixture of modernised pop and street art. 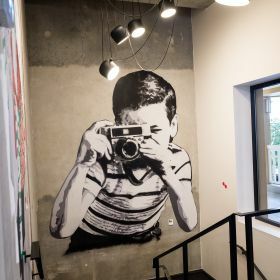 Mr Brainwash likes to transform everyday objects into genuine works of art. Today he works with international celebrities such as Madonna and the Red Hot Chili Peppers.